Since the time these two greats graced the footballing arena, the footballing crowd has been spoiled for quality. Before and along with these two south American talents were many great footballers like Alfred De Stefano, Puskas, Johan Cruff, Franz Beckenbauer,Michel Platini, Eusebio, Gerd Muller, Bobby Carlton and etc; however no one were ever spoken about in the same vein as these two were. Even though the destiny of greatness united these two (in a way), they were distinctly separated by their temperament. Pele was always considered a perfect professional & a perfect role model because of his on field and off field behavior; however Diego was always the most mercurial player surrounded with controversy and bad press linked to his behavior and personal problems. Over the years, impostors of many shapes and sizes from Argentina and Brazil have been compared to these two greats and none of them were able to fill up the vacuum left by these two in the hearts of football lovers. 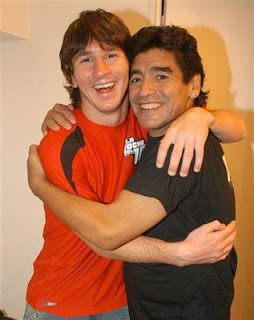 However off late, the emergence of Messi and Robinho has triggered the talk of the New Maradona and the New Pele again. In many ways Robinho and Messi share there masters’ class, vision and prodigious talent, but this is where the similarities end. Since the time Messi started playing with Barca’s first team, he has lived up to all the comparisons to the Argentinean legend. In fact, Messi has gone from strength to strength and even drawn comparison from no other than Maradona himself, but having said, that Messi reminds us of Maradona in all aspects except his temperament, where surprisingly he reminds us of Pele and not Maradona. Messi's ascend to the top has been built on strong foundation with the right mix of commitment, maturity, hard work and professionalism. Many clubs have tried to lure him away from Barcelona, however Messi's commitment to the club, has made the club's decision easy and simple. It was not a surprise to most people, when Messi performed the same miracles as his predecessor, scoring goals that Maradona did in a similar fashion. Consequently, it won't be a surprise if Messi surpasses Maradona’s talents with some of his own and sets examples for future Messis to follow. On the contrary Robinho with his mercurial talent has set the world stage on fire, and of late it is not because of football that he is in the news. He showed glimpses of his talent when he was playing in Santos and was tipped for bigger things when he signed for Real Madrid, however surprisingly he does not have the temperament of his master, but surprisingly that of Maradona. During his three years stint for Los Blancos he promised but failed to deliver when it came to talent on the pitch. He was so unprofessional that he drew comments from the sporting director of the club who had complained about Robinho smelling of booze in the dressing room. To add to his expanding list of unprofessional acts, his transfer saga drew a lot of criticism from even the unexpected quarters, with Pele condoning his move to Manchester (City). It's difficult not to be tempted with big money in the offing, however considering the fact that Robinho's desire was to be the best in the world, it would have been a easy choice to make. It would have been the right choice if he had chose to on at Real Madrid and continue in his quest to achieve greatness. And the Bernabeu faithful absolutely loved and adored Robinho. Instead Robinho chose not to confront the problems that he was facing and decided to be the big fish in the small pond by accepting a backdoor exit move to Manchester City. He allowed his lust for money to kill his footballing soul. From a very promising career and possible greatness, Robinho is now all set to confront his worst fear, with demons of relegation lurking in the shadows. His temperament, has time and time again, put his master to shame and has pushed Pele to the extent of recommending professional counseling for his off field behavior. It is almost certain that Messi will perform just to the expectations, but it would be foolish to write Robinho off because he still has a long career ahead of him. But it would hardly be a surprise for most, if Robinho turns out to be a gaffer and does nothing to fulfill his potential. We will wait for the future to answer this question. robinho's salary was even lesser than salgado, whose salary was even low. calderon's public chase of cr7 made him leave the club. having said that, like ronaldo and ronaldinho, his lifestyle is spoiling his career.